This gorgeous artwork is courtesy of Annabel Ruffell. You can find more at annabelruffellart.com! Happy Memorial Day to everyone, and a heartfelt thanks to all who protect and serve this country, I appreciate your service! Today’s meeting was small in quantity (6 attendees), but huge in quality. I have written, on more than one occasion, of the concept “the magic of the meeting.” It’s when you go to a meeting, and something amazing happens that makes you realize there is a power greater than yourself, and that power is at work in our lives. Today was such a meeting for me. This is the fourth Monday of the month, and so theoretically I would be continuing in a series of readings I started last month. The problem that I realized yesterday was that my week had been busier than usual and so I did not adequately prepare for this reading. I resolved the issue by deciding I would bring the book with me, and poll the group (in my Fellowship this is called asking for a “group conscience” decision): should we do the reading and just pass the book around, or switch with next week’s Big Book meeting, thereby allowing me the time I need to prepare the copies for next week? I could roll with it either way, so I went about my day on Sunday. A.A. and acceptance have taught me that there is a bit of good in the worst of us and a bit of bad in the best of us; that we are all children of God and we each have a right to be here. When I complain about me or about you, I am complaining about God’s handiwork. I am saying I know better than God. So I’m better off if I don’t give advice, don’t figure I know what’s best, and accept life on life’s terms, as it is today- especially my own life, as it actually is. I have been doing quite a bit of complaining about one of God’s children lately, the one that faces me in the mirror each day. Another famous part of this story talks about when you focus on the problem, the problem increases, but when you focus on the solution, the solution increases. Guess where my focus has been of late when it comes to myself? Any other time I have read this story I have related it to my judgment of other people, my assumption I know what’s best for the rest of the world, and my general treatment of my fellow human beings. Today I was able to read it from the perspective of how I treat myself, and it was illuminating… I walked out of the meeting feeling better than I have in weeks! And that wasn’t the end of the magic, either. A newcomer to the meeting was teary-eyed as she shared, she was so overcome by the significance of that story for her. She is dealing with a family situation that is uncomfortable and difficult. She believed herself to have been handling it in the least judgmental way possible, but reading this story made her realize that she needs to look more closely at her actions and the effect her actions are having on her loved ones. She seemed really grateful to have been at this meeting to hear this story. Some magical meeting stuff for this beautiful Memorial Day! Hope you are finding the holiday to be a relaxing one (unless you are my friends from Canada, or New Zealand, or Australia, or anywhere else… I hope all of you are having a Magical Monday!). A personal holiday as well… this day, 14 years ago, my husband and I became parents for the first time… happy birthday to my beautiful daughter! Do not write today, nobody wants to hear this crap. But isn’t that the point of this blog? Maybe so, but whining for the sake of whining is helpful to no one. But might it help… me? I am sad today, I was sad yesterday, and the day before that. My best friend’s father passed away, too soon, and with some tragic circumstances attached. I am sad for my friend, I am even sadder for his Mom. Although my father has been dead for 22 years, anytime the death of a parent comes into play, I relive that experience as if it just happened. I dream about it, it is my first waking thought, and I feel like I can’t escape it. So I’m sad that my father is dead. I feel strongly that I should be able to get a better handle on my emotions, but can’t seem to do it. I’m angry and impatient with myself for how much I’ve been crying, and then I’m sad that I’m mad. And then I’m confused over which exact emotion I’m even feeling. I’m sad that my friend will read this and think he has to comfort me, when it is I who should be comforting him. I wish I could prevent this post from going into his inbox. Today is my son’s field day trip, and for reasons that would take to long to explain, I can’t go with him. I am really, really sad about this. I have abused the only crutch I feel like I have left… food… for the past three days and have probably reversed any good I have done in the weight loss department (slight silver lining: this has kept me off the scale, so at least I’m not compulsively weighing myself). I am sad that I gave in to this instinctual need to comfort myself with things I know will not comfort me, sad that I just sidelined my diet, sad that I have to admit this mistake. The out of control eating has left me sluggish and unable to exercise as I feel I should, which panics me at the thought of a rapidly approaching 5K to which I committed. I am frustrated that I can’t get the proper perspective on this subject, and I am sad that I am not exercising as effectively as I was. I am tired of myself, and I feel guilty that I am subjecting myself to all of you. I am sad that I am not using the tools I have been so generously given. As I type, I feel a pinprick of an emotion that has been foreign for the past few days… hope. I am hopeful that shining the light on these troubled thoughts and feelings might banish them, or at least lessen their severity so I can get back to a better place mentally. We’ll see what happens, but I guess a glimmer is better than none at all. 1. Gaining a “right sized” sense of self: Prior to sitting down and hashing out all of my deep, dark secrets, I carried a lot of shame around with me, and a deep conviction that I was a lesser human being. In confessing these secrets to another person, and hearing the person say, “you are not alone,” gave me a sense of relief that was palpable, and I carried forward from that day the understanding that we are all flawed human beings, we all make mistakes, and I am okay just as I am. One of my favorite attendees (but, who am I kidding, they are all my favorites!) talked about step five being the beginning of getting back to ourselves. And I can really relate to this… carrying around all of the guilt of my active addiction, living with the lies and deceit while in active addiction, not understanding all of the “isms” that led to my addiction, how was I even to know who or what my real self is? Unloading the past is a prerequisite to getting to know the authentic self, and step 5 is a great way to unload the past! Another long-timer shared that he had a lot of anxiety prior to taking step 5, as he felt much the same shame that I described above, so for him the anxiety and drama leading up to step 5 was great. He said by comparison, once he finished step 5, it seemed almost anti-climatic, and felt almost let down. But, over time, he realized that there was no more pivotal moment for him throughout his step work. For him, realizing the benefits of taking the step was a gradual process, but had a huge payoff. The overall consensus from the part of the group that had completed step 5 was the immense relief in knowing we are not alone with our mistakes, and that we are not the Worst People On Earth! Losing that sense of isolation proves to be worth the difficulty in summoning the courage to complete step 5. Finally, and this is why I chose the graphic above, an attendee shared that step 5 gave him a greater sense of intimacy, starting with himself and extending to his family, friends and the Fellowship. 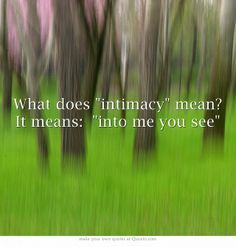 He defined intimacy as “into me you see,” and doesn’t that make perfect sense? Remembering the miracles that I experience regularly within the Fellowship, I am just so grateful! You are suffering from a condition called “Overshooting The Goal-Setting Mark.” Fortunately, this condition can be arrested and corrected with a few simple steps. Once in a calm state, take quiet time, pick one goal, and Let. The. Rest. Go. Today is a day of rest… no accounting of anything today, and I am going to enjoy it! M(3), 5/12: Do Meeting Makers Really Make It? Happy Monday, and I hope all the Mom’s reading had a spectacular Mother’s Day, I surely did! Today’s meeting was a rewarding one for me in many ways. First, we had a decently sized group (14!). Second, there were three newcomers, and it’s always nice to have a new perspective in the sharing section of the meeting. Finally, the topic of today’s meeting is one that hits close to home. We read from the book Living Sober, a chapter entitled “Going to AA Meetings.” The chapter explains the basic nuts and bolts of 12-step meetings: the format, the various types, what to expect if you choose to attend one. If you are new to sobriety and/or interested in 12-step principles, I highly recommend giving this book a read; it is an excellent resource. The topic hits close to home for me personally because it was a great reminder of why I chose to attend 12-step meetings in the first place: I am an alcoholic/addict, and 12-step meetings are a form of medicine for me. Someone reading this post without knowledge of addiction might question the concept of sitting in a room with like-minded people and talking to be a form of medicine; frankly, I have questioned it myself. I especially questioned it when I was first exposed to 12-step meetings, years before I actually got sober. At that point, I had great difficulty in identifying with anyone in the rooms of AA. In fact, I spent great energy looking for ways in which I was different. Of course, with that attitude, the outcome was inevitable: I stopped going to meetings, and I eventually chose to drink again. Whether those two facts are connected would probably be up for debate; I am of the opinion that they are directly connected. When I hit my bottom, I consciously chose a new attitude towards meetings; I deliberately sought out ways with which to connect with the people in the rooms, with the literature I read, with the stories I heard. My focus was now on how to assimilate, rather than how to differentiate, myself. Of course this was a process, but in time I started to feel what is described as the “magic of the meetings.” I would sit down, and the topic would apply directly to events in my life. I would meet someone, and we would feel like instant family. I would feel like I was exactly where I needed to be! As time goes on, of course, it becomes more of a struggle to attend meetings. Busy schedules, the feeling that “I’m okay, and I can live without a meeting,” or a resentment can pop up that can make continuing attendance difficult. And, as I’ve been told by countless wise people, that’s just when you need a meeting the most! Often the question is asked, “How long do you need to keep going to meetings?” The standard reply, at least in my part of the world: “Until you want to go!” And that is true, even as interest ebbs and flows. One of the newcomers in today’s meeting told his tale that is, sadly, a familiar one to those of us who are regular meeting attendees: he had a decent amount of sobriety (more than 2 years), and then life got busy, and he decided he did not need to make meetings a priority anymore. He said he faded off to no meetings, and within a week or so he had people calling him: are you okay? did you relapse? He indignantly replied that he did not relapse, that he was fine! He said it only took about a month to convince himself that he was cured of his disease, and that it would be okay to drink again. He has about month sober now, but he admits it is much more difficult this time around, because he is fighting the shame of giving up those 2 plus years. I have the blessing of 3 or 4 regular attendees with decades of sobriety, so I was most anxious to hear what motivates them to continue their meeting attendance after so many years. 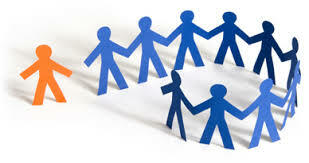 Each of them shared, and were in complete agreement: it is not a struggle to attend meetings, it is a joy. They attend meetings because they want to attend, not because they feel they “have to.” Meeting attendance is as much a part of their lives as brushing their teeth or showering is a part of their hygiene! The final thought I will share is from one of my friends with almost 30 years of sobriety. She compared meeting attendance to breathing: in order for breathing to be successful, you need to breathe in and breathe out; not much good comes out of simply performing one or the other. In the same way, there are two components to meetings: taking in what you need, and sharing with others what you’ve learned, and they are both critical to the success of meeting attendance. This analogy was a great reminder for me. When I am too much in my own head, I forget that meeting attendance is not all about me; that service is the foundation of the 12-step philosophy. Keeping the question, “how can I help another?” in the forefront of my mind at meetings will remind me to be of service, which will, of course, circle back around and enrich my own experience at the meeting. Lots of motivating stuff today, and, as result, I am going to get out to at least one new meeting this week! Made a carrot cake to celebrate someone’s one year anniversary of sobriety, and I was nervous, because I had never made one before. But the reports are in: the cake was delicious! Alright, what’s everyone gotten from their Mom’s? Words of wisdom, life lessons, or just hilarious stories, I want to hear them! 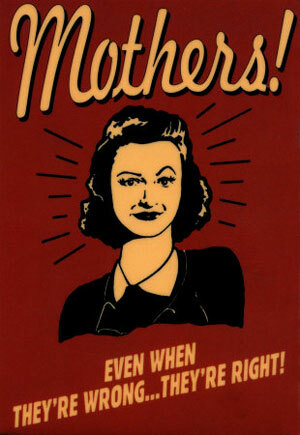 And for all my beautiful maternal friends, enjoy the weekend, you deserve it! Mothers definitely count as a miracle; I don’t know what I’d do without mine! Moving away from the gifts of health (read Part I and Part II to catch up), but continuing with the birthday celebration, on the actual day of my husband’s birthday I held a small, informal, mid-week get together to honor the date of his birth. He did not want a party, but all of our friends and family wanted to wish him well, so I thought this would be a nice compromise. I made some of his favorite foods, went into the city and picked up some trendy take-out, and had our friends and their kids run around the house for a few hours. I put this informal gathering together pretty last-minute, and so of course several people on the list could not make it for one reason or another. As I reviewed the group that had rsvp’d affirmatively, I breathed a sigh of relief, because all of them know that I am in recovery, and that my husband and I choose not to drink. There were a few on the invite list that did not know, because I see them infrequently, but they were either unable to make it, or did not respond to the invite. As the party got underway, one of my friends mentioned that she had spoken to another friend who planned on stopping by, but had never told me she was coming. At this point I am knee-deep in hostessing mode, and so it briefly crossed my mind that this was a friend who did not know I am sober, but it flew in and out of my head pretty quickly. It being a work night for adults, and a school night for children, I was not anticipating a late night, and if the friends are coming “later,” how big of an issue could it be? Important disclaimer: this is absolutely no one’s fault but my own. I have been friends with this woman for decades, and I have served wine at every single party I’ve ever hosted. I could kick myself, even this minute, for not anticipating this situation. And I try to rush this along, so I’m now listing out every beverage that I can think of that we have available to us (and yes, I’m listing things like orange juice and milk, I’m not kidding when I say SITCOM). So she picks, and selects something I did not list, and do not have. Now twice I have to deny a beverage request. My face, undoubtedly, is the color of a tomato at this point. So we go out to the privacy of the garage, and I briefly but quietly explain that I am in recovery and that my husband and I no longer drink. I apologize (probably a little too much, but Monday morning quarterbacking isn’t getting me anywhere) for not taking the time to sit down with her before this, and I apologize for making her uncomfortable. She continued to be flabbergasted, but before we left the garage she was at least able to verbalize a little better what she was feeling, which was astonishment, as she had no idea that alcohol was a problem for me. I thanked her for the compliment, but assured her that indeed it was, but that the good news is that I have a few years of sobriety under my belt, and life is really, really good. I assured her that I would be willing to sit down one-on-one and speak in more detail about this subject, if she so chose, and then I led her back into the party. If nothing else, this is a cautionary tale for the newly sober: if you’re going to host a party without alcohol, make sure people know before they arrive! I still cringe as I think of the evening, but, really, what am I going to do? At some point I am going to reach out and offer to sit down with her, and give her the option of talking about it. Other than that, I guess I’ll just chalk it up as another painful life lesson. I would very much love to hear if anyone out there has similar story, and how they handled it! As I reflect on the story I just told, it was a miracle that I did not offer her the olive oil and balsamic vinegar in my pantry as drink selections! To continue on with yesterday’s story, in which I was regaling you with tales of my absence from writing, I had decided to do things, rather than buy things, for my husband for his birthday this year. Yesterday I talked about getting up-to-date on my medical nonsense, but I also wanted to do something else in time for his birthday. It was this gift, more than all the doctor’s appointments, that kept me away from the computer, and the blog, for the past few weeks. Call it ego, call it pride, call it shame, this part is hard to admit, but I believe putting it out there will keep me committed: I wanted to officially call myself a non-smoker. I can hear the gasps, especially the people who know me and wouldn’t know about this part of my life. You see, I smoked like the alcoholic/addict that I am: secretly. Which is pretty difficult to do, given the olfactory consequences of the action of smoking! But I am clever, and I was also determined not to walk around smelling like an ashtray, so the fact that I smoked was known only to a very select few people. Quick history with my smoking: started in graduate school, gave it up when I started dating the man who would become my husband, did not even think about it again for about a decade. A family member’s personal crisis had us bonding together over cigarettes about 8 years ago, and since that time I have been hit or miss. Then, when I hit my personal bottom, and was separated from my husband and family, oh boy did the smoking take front and center stage. Talk about replacing one bad habit with another! That period went on for about 6 months. The more confident I became in my recovery, the less I relied upon smoking, until I got to about where I leveled out: less than 5 a day, about 4-5 days a week. In other words, this habit was entirely mental, as I could go for days at a time without wanting or needing one. Which goes to prove mental habits are just as hard to break as physical ones, at least in my case this is true. I have been planning to quit at every recovery milestone, but couldn’t seem to make myself do it. I just recently heard someone in a meeting talking about his experience in AA. He never had any doubt that AA works, as he spent a long time coming to meetings, but continuing to drink, and he saw for himself the people who stayed sober. He wanted sobriety, he explained, he just didn’t want to give up drinking in order to get it. To those who have never struggled with addiction of any kind, this logic probably sounds absurd; he said it, and I got it immediately, as it summed up perfectly how I felt about smoking: I wanted to identify myself as a non-smoker, I wanted all the benefits that come with being a non-smoker (not having to worry about smelling, clear lungs, better health, the list goes on and on), I just didn’t want to stop smoking in order to have those things. I’m not sure what it was about my husband’s looming birthday that was motivating me, but I finally got serious about ridding myself of this albatross once and for all. My husband, to my knowledge, has never smoked a cigarette. I mentioned I gave it up when we were dating, largely at his request. We have had many, let’s call them spirited discussions, about my smoking, and he is one of the key reasons I am as fastidious as I am about not smelling “like a smoker.” I know that he has deep fears about my health, and that I have not taken those fears very seriously, and that is why I thought this would be the most meaningful gift I could give him. I have stopped and started too many times to count, but in recent years I had never gotten further than about 6 days without giving up. I also know that the greater the time removed from smoking, the less likely I will be to pick up a cigarette, because I will come to cherish my “smoke-free” days as I do my sober ones. The trick is stringing enough of them together for them to matter to me. So I picked date, I enlisted the help of my Mom, and I employed the next tool I learned in recovery: I figured out where and when I was most tempted to smoke, and I changed everything I could about my days to increase my chance for smoke-free success. As I mentioned, I was an isolated smoker; I was very uncomfortable smoking in any public place. So for about two weeks straight, I kept myself out and about as much as I could, and changed up my schedule as much as I could, to limit my opportunities to smoke. I also gave myself incentives along the way, things that motivated me to continue on the journey. Giving these rewards served two purposes: the obvious, a reward for a job done well (not smoking), but also a motivation to continue on the journey (if you pick up a cigarette now, you just ruined the reward you gave yourself yesterday). Silly stuff that would not matter to anyone but myself, but I’ll tell you, this strategy really kept me going. Finally, accountability: I started with just my Mom, because I was so scared I would mess up. But then, slowly, I let people in on what I was doing, and each person I told strengthened my resolve all the more. I feel like I really turned a corner when I announced it at my Monday meeting, and asked them to ask me about it the following week. I knew if I got that bold, then I was probably not turning back. And I didn’t. I was able to share this news with my husband, who was, again, very relieved to hear that I had given up this health endangering act. For myself, the process certainly had “notes” of recovery… a time of day when I would normally have a cigarette, and then I would remember, “oh yeah, I don’t do that anymore,” and I would feel that sort of empty sadness that comes post-addiction, but overall the process was not nearly as gut-wrenching as recovery from other mind-altering substances. I have had numerous people remark that giving up smoking was far worse than giving up drinking; for me that simply was not the case. I had about a week’s worth of feeling irritable for no particular reason, but it faded pretty quickly. Now, when I get that feeling of “wouldn’t it be nice to have a cigarette,” I have a bunch of concrete reasons to say no: I’ve come this far, I have people to answer to, I would have to go back to all that “cigarette subterfuge” that I hated so much, and, now, I would have to report back to all you! My name is Josie, and I am a former smoker! …because I have fallen off! But now I’m jumping back on! If I don’t, I’m worried that I will taper off to nothing, and that would be, as the kids say, totes cray-cray! So, I will play catch up, and I will try to write a little bit each day, hopefully by the end of this week I will be back on track. So starting with today and moving backwards: the meeting today was a decently attended Big Book meeting. We read one of the personal stories, entitled “Student of Life,” which is a favorite of mine because the author is from the Philadelphia area, and it is from more recent times (she wrote her story in 1998, and to my knowledge she is still alive and well, and active in our Fellowship). A common thread in our sharing today was the pervasiveness of denial in the disease of addiction… the lengths we would go to in order to convince ourselves we did not have a problem with alcohol. The most common tool of denial? The old stand-by: I’m not an alcoholic because I haven’t lost my family/gotten fired/crashed a car/been arrested. Yep, every one of us has said that line to ourselves at least once in active addiction, but we all agreed on two points. First, the longer you hold off with those justifications, the more likely they are to materialize; and two, we were always worse off than we told ourselves we were. One friend of mine told the story of how she viewed herself as a drinker. Years later, she was with her sister and another woman was quite obviously drunk, and acting foolish. My friend had been sober for a few years, and so asked her sister, “Jeez, did I look that ridiculous when I was drunk?” Her sister’s reply? “ARE YOU KIDDING? YOU WERE WAY WORSE THAN THAT!” My friend was flabbergasted! Quick update: the woman I wrote about last week (read M(3): Kickin’ Recovery Old School for more details) did not show up today, but I did have two other attendees comment on her disruption, and thank me for putting the brakes on it, so I feel as I did the right thing last week. Alright, now on to some of my adventures while I have been in absentia from the blogging world. As I’ve mentioned, my husband celebrated a milestone birthday this year; in fact, it was one of the reasons we enjoyed a fabulous Caribbean vacation a few weeks ago. His birthday was last Thursday, and so part of the reason for my absence was increased activity in terms of planning surprises for his big day. I will talk more about the celebration of his birthday in a later post. I had been contemplating what to do in terms of a gift for him for weeks now. On the one hand, milestone birthday deserves milestone gift. On the other, shouldn’t the trip count as the gift? My solution: do something, rather than buy something, and do it, milestone-style. I came up with two actions, they may sound absolutely insane to the outside world, but you have to take my word for it, these are things he has wanted for a very long time. And so it should come as no surprise that I have been, well, let’s say a bit lax in the annual physical department, and it bothers my husband to no end (who also does not go to doctor’s, but I’m assuming this is a “do as I say, not as I do situation). Anyway, I figured I could take a couple of weeks and get up to speed on all those things normal people do every year of their lives: blood work, mammogram (I am 44, have not had the pleasure before now), vision check, gynecological stuff, and, while I’m at it, I’ll get that knee that’s been bothering me checked out. Side story that brings the point of my medical carelessness home: I called my Ob/Gyn to schedule the appointment, and explain to the receptionist that I want to make a routine appointment, but that it’s been a while. She asks my name, attempts to look me up in the computer, I am not there. So she say she has to back to the records room, and asks me the name of my doctor in the practice. I name him, and she informs that he has been retired for several years now. I guess it’s time to schedule the exam then! Here’s the absolute miracle of the whole thing: all is well, medically speaking. Blood pressure an amazing 118/80; cholesterol an unbelievable 145, vision did get worse, and of course I’m looking towards a future of bifocals, but that comes with the middle-aged territory. Mammogram, pap smear, knee x-ray, all completely normal. One little glitch is that my hemoglobin is low, but I’m pretty sure an iron supplement’s going to work that out, and, the most important part of that story: I scheduled, and plan to keep, the follow-up appointment. So a lot of running around, a lot, lot, lot of discomfort, for doctor’s offices bring back some painful memories of active addiction, but I set a goal of getting my medical stuff in order, and I did it. My husband, was, as I suspected he would be, very touched by the gesture, pleased that I am up to date, and relieved that everything is a-ok. I would say, given the negligent way I have treated this temple I call a body, that my Honor Roll health report constitutes a miracle!